Whole, free range, antibiotic and hormone free chicken. That’s a mouth full but a must when eating meats. I prepared my chicken soup in a crockpot and let it cook the entire night. Sleeping with the scent of homemade food in the fall is very comforting. Waking up to a warm meal is even better. There has been a long standing statement that chicken soup is a remedy for the common cold. Many people have looked into the cause with curiosity. What makes chicken soup so soothing? Is it the fats in the broth and the coating of the throat, the protein in the chicken? There is a lot to say about immunity. Our immune system is constantly working to help us fight off, microbial, foreign invaders. White blood cells are made in the bone marrow. Keeping our bone marrow healthy helps keep our immune system healthy. Slowly stewing or boiling chicken allows the bone to break down and the marrow to seep out. When we eat chicken soup we also drink the marrow from the chicken bones and all of the complex properties that goes into the making of bones. But this is not enough, I also like to ask about the actual emotional process that goes into the preparation. I think about the LOVE behind the action and the traditional values that have been passed down to us. The human spirit of wanting to heal others. These intentional healing properties have historical voices that are ingrained into the fabric of our being. We know that thoughts are matter and if we have positive thoughts we have positive, physiological reactions in our bodies. Therefore, we can not overlook the healing properties of belief. 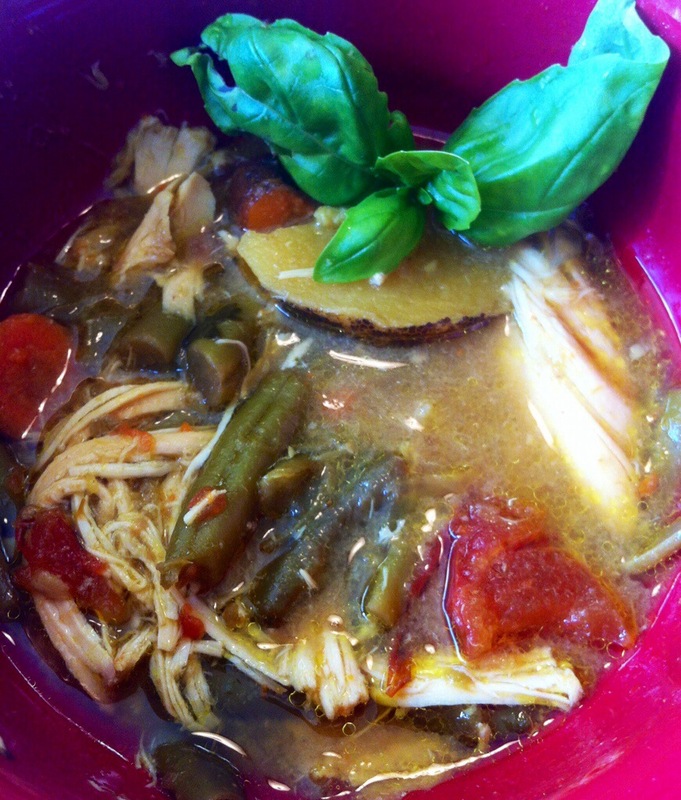 Chicken soup reminds us of a cozy place, mom’s kitchens, warmth, hope and wellness. What better way to raise our spirit and health than with the belief the chicken soup heals. For fiber and color I add green beens and carrots. Potatoes seem to satisfy the carbohydrate category and pair well with a protein to help slow down glucose spiking. extra virgin, first/cold pressed olive oil and fresh ground pepper. Eating Beautiful is both an internal process and external process. It envelopes all our senses. We not only see and taste the beauty of the food but the food itself purifies us from the inside out. There is nothing more beautiful than feeling good.